"Fear runs down your spine like ice water. Pressing your shoulder more firmly against the door; of the rotting cottage, you hope that your strength can prevail against the beast that hunts you. It lurks somewhere outside -- waiting, watching. If only someone else had been sent out into the night, into the swamp to battle this creature. All has been quiet for two hours now. The monster wants you to believe that it has given up, gone to hunt less wary prey. But you know it can't be far away, for the night is silent as a grave and the air is fitted with a deathly CHILL. 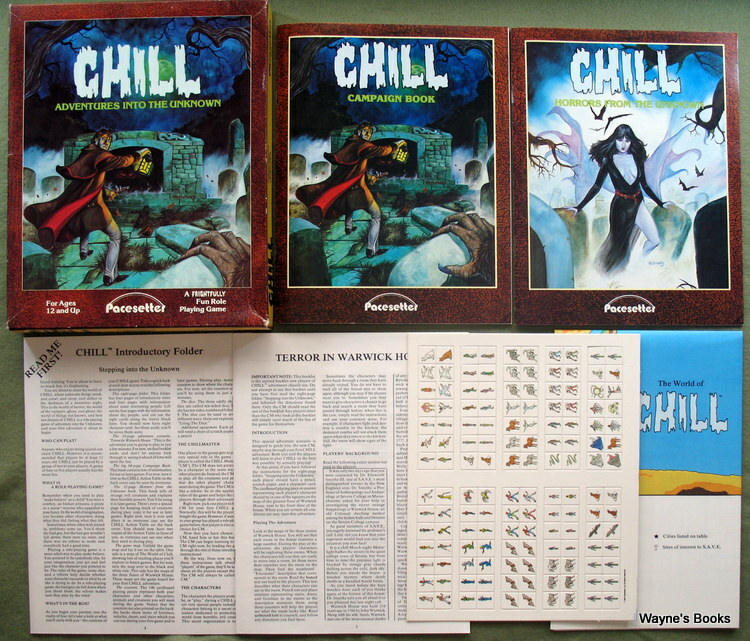 CHILL™: Adventures into the Unknown takes the role playing game: one step beyond, into the eerie realm of ghostly horror. In this box lies everything you need to create an entire world of terrifying adventure. 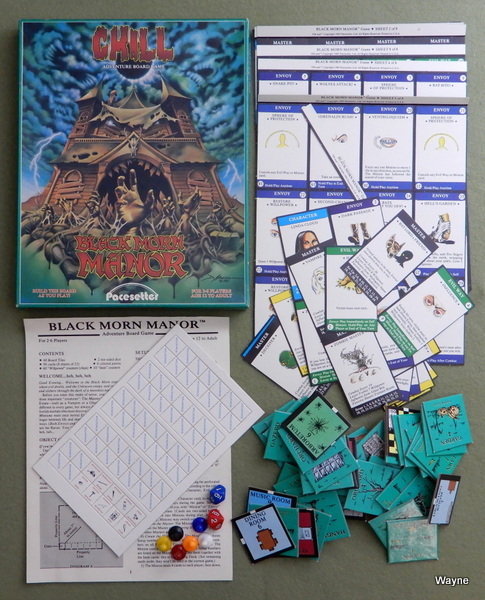 Inside, you will find a 64-page Campaign Book, a 32-page manual of creatures, a 16-page adventure, three dice, playing pieces, a large color map and a special introductory rules folder which allows you to begin playing within minutes of opening this box. Cross the threshold. Venture out into the night fog and enter the world of CHILL." deadly mystery, and it has all the advantages: it's expecting you, its "pets" are ferocious, and it resides within a fortress of supernatural malevolence. * The creature changes too; 10 different fiends — all of them deadly — haunt the Black Morn estate. * Most terrifying of all, you can trust no one. Your companions may suddenly become enemies... your enemies the only hope of survival. This box contains everything you need to play: a full color board in 48 moveable sections, a rules folder, 96 cards, 6 pawns, 70 playing pieces, and 2 high-quality ten-sided dice. The gate is open wide; why don't you and your friends come inside?" "Lurking deep within the rain forests of Yucatan, death awaits its next victim. It swallowed the great civilizations of southern Mexico centuries ago, and now it rears its decaying head once again. The ocelotl have returned. The Indians say the evil cat-things roam the jungle even now the jungle that looms before you. An unnatural stillness hangs in the air as you stand at the edge of this tangled green world. The jungle beckons, challenging your courage, mocking your doubts, and somewhere, hidden among the twisted trees and hanging vines, the ocelotl are waiting, prowling the outskirts of the Village of Twilight. 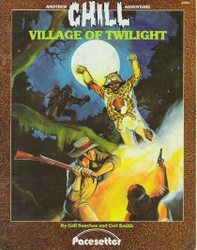 "Village of Twilight" is an adventure for use with the CHILL game system. Inside you'll find the character cards, maps, background information, and hours of thrilling role-playing fun. Be sure to look for other fine products from Pacesetter, Ltd."
1984 ... Gali Sanchez & Carl Smith ... 28 pages ... PACE 2002 ... ISBN ?? "Disaster erupts all around, leaving no time for reaction. Your small boat smashes into a million splinters, dashing equipment and crew alike into the cold, dark water. Choking for air, you claw back to the surface. Nearby, friends cry out in fear and pain, but the brackish water clings to your face like ink, making it impossible to see. In the distance the water churns and bubbles, boiling with the monster's unseen presence. Then, with supernatural quickness, all is quiet again. Something cold brushes past, a wisp of feeling, almost undetectable. You gasp, kicking hard into the unseen depths, but finding no sign of the dreaded thing. To think that only this morning you had all been safe. Research and caution had made many of the strange perils of this expedition almost easy to handle. The bizarre deaths, the mysterious assailants, the unearthly disappearances... all seem commonplace in the face of this new horror. A scream to the left shatters the silence. Panic-stricken, you thrash about helplessly in the murky darkness. In this last moment of lucidity you realize how foolish it was to match wits with the Highland Terror. 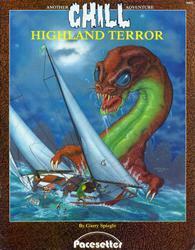 "Highland Terror" is a 32-page adventure for use with the CHILL game, system. Inside you'll find character cards, maps, background information and hours of thrilling role-playing fun. 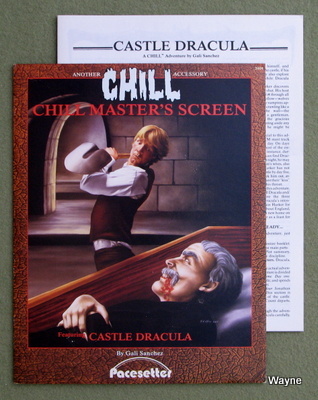 Be sure to look for other fine products from Pacesetter, Ltd."
"The CHILL™ Master's Screen puts all important charts and tables from the CHILL game right at the CM's fingertips. 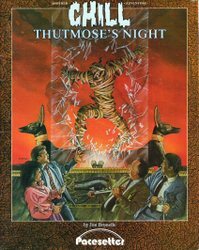 It also features a frightfully fun bonus that pits a player one-on-one against the bloodthirsty Count himself, in a special 8-page adventure adapted from Bram Stoker's DRACULA." 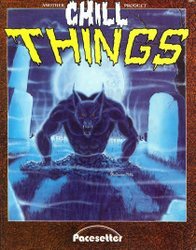 "Contained within this book are 64 pages of terrifying new Creatures and Evil Way Disciplines for use with the Chill role-playing game." "In a Victorian London estate, Mina Harker prepares for slumber — a slumber she fears more than death itself. A wolf begins to growl beneath her window. Count Dracula. Lord of the Undead, has come to call. In moments, the Count stands before her, immense and cloaked in black. His eyes burn red, like Hell's very fires, freezing her on the spot. "For seven years I have waited. For seven years I have grown strong. Did you think that mere knives could destroy me? Fool! Again, you would play your wits against mine! Mine that are centuries old. Mine that shall never die!" He draws open his shirt, and with his long pointed nail, he slices to a vein in his breast. An icy fluid spurts forth. "Flesh of my flesh, blood of my blood, companion and bride," he growls, drawing her to him. Mina's hair cascades from her face, revealing two crimson marks on her throat. And so it began. Seven years after Mina and Jonathan Harker helped strike down the Count, he has risen to seek his revenge. One by one, the victims fall, one by one, until... only you... can stop the Vengeance of Dracula. 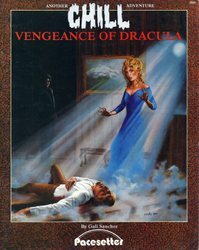 VENGEANCE OF DRACULA is a spine-tingling adventure that carries on Bram Stoker's original story, DRACULA. Inside, you'll find a chilling tale, character cards, maps, and hours of role-playing fun. Be sure to look for other fine products from Pacesetter." • the haunter of dreams stalks a contemporary woman, who foresees her own brutal murder.... A single place links these horrors: Moorcrest Manor, an isolated Devonshire estate. And a single hope remains: You. That is, if you dare face the Haunter of the Moor. 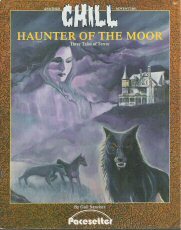 HAUNTER OF THE MOOR features three separate, spinet tingling adventures spanning nearly a century of terror. To play, you'll need a CHILL game and two to eight hardy souls. Inside, you'll find player aids, maps, and hours of role-playing fun. Be sure to look for other fine products from Pacesetter." 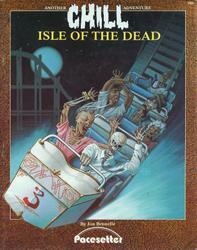 Isle of the Dead is a carnival adventure for use with the CHILL™ game system. 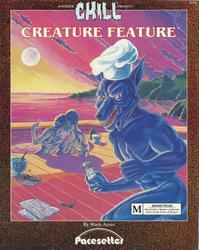 Inside you'll find pregenerated characters, player aids, maps, background information, and hours of role-playing fun. Be sure to look for other line products from Pacesetter. Ltd."
"It is the hour before dawn, the darkest hour, the hour when the dying most often slip away into that final flight from which there is, for most, no awakening, A soft breeze from the Nile River stirs the curtains, and Thutmose, Pharaoh of all Egypt, restless with pain, tosses fitfully on his bed. "Merritet," he calls weakly, and at once the man, who has been standing all through this long night at his king's bedside, leans close so as not to miss a word, "You called, my lord? I am here as always." Pharaoh's eyes seem distracted now, as though some part of him were watching for something only those close to that other world can see. The jackals of death, perhaps. And how many of the people burdened by this cruelest of Pharaohs might wish those jackals quickly fed? "Merritet? You will not leave me?" the dying man whispers, plucking fretfully at his servant's arm. "You know I will not, my lord," Merritet replies as he secretly touches the vial of poison hidden in his cloak, the vial that will allow him to accompany his king on the journey to the Underworld and one day, perhaps, help him walk again in the land of the living…"
— Play a werewolf... and bite the hand that feeds you! Part Two: New combat rules for CHILL. Do you know the difference between a .45 and a standard NATO round? Think a spear should be less deadly than a musket when you're playing CHILL or CREATURE FEATURE? Then these are the rules you've been waiting for! Part Three: New slants on S.A.V.E. Now envoys can battle one-on-one with a ghost, beyond the realm of their bodies! At last, S.A.V.E. presents the highly dangerous Incorporeal Disciplines: Seance, Leave the Body, and Incorporeal Attack. It's a whole new form of the Art! You'll also discover new skiils and new equipment, and the modern S.A.V.E. organization. Don't-miss reading for every CHILL player." 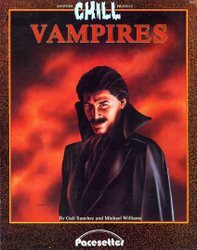 "VAMPIRES is a collection of stories, portraits, and accounts often bloodcurdling creatures who haunt the nights of our legends, the wastelands of our fears. Each of these vampires is not only the center of horrific reports and tales, but is also a fully drawn non-player character designed for use with the CHILL role-playing system." 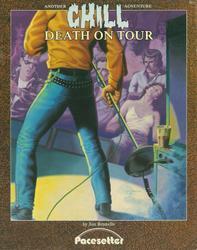 Turn up the volume: you've just tuned in "Death on Tour," another terrifying adventure for use with the CHILL role-playmg game system. Inside, you'll find character cards, maps, background information, and all of the plot encounters you'll need for hours of horrifying fun. 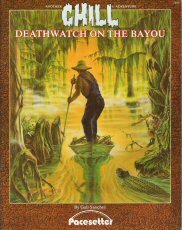 * 'Timbalier Terror,' a tale of the bayou's living dead. * 'Mystery of Isle au Pitre,' the story of a gulf island that claims its visitors forever. Inside you'll find maps, characters cards, and hours of suspenseful role-playing. Be sure to look for other fine products from Pacesetter." "Blood Moon Rising is a hair-raising adventure of lycanthropic terror, stretching from the barren wastes of Alaska to the crowded streets of Milwaukee. Inside, you'll find a shivering tale of bloodthirsty beasts, character cards, maps, and hours of chilling fun. 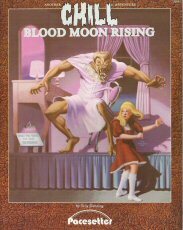 "Blood Moon Rising" is for use with the CHILLS role-playing game. Be sure to look for other fine products from Pacesetter." 1985 ... Troy Denning ... 32 pages ... PACE 2014 ... ISBN 0917609328? "Beware, for the night approaches, and the roads grow dark and treacherous. At times like this, you should not be alone. • to towns haunted by many forms of death. • to the threshold of houses where unspeakable secrets dwell. ...and to more places guaranteed to give you... Unpleasant Dreams. ELVIRA®, MISTRESS OF THE DARK® is your guide through EVENINGS OF TERROR, nine horrifying adventures designed for use with the CHILL® role-playing system. Each adventure can stand on its own as an evening's entertainment, or as a terrifying episode in an ongoing CHILL campaign."